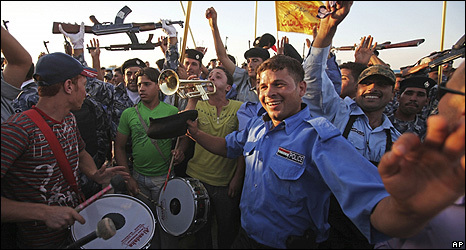 There was a pop concert and celebrations in the Baghdad zoo park, fireworks in the night sky, and jubilation in the streets. Security forces were everywhere, all leave cancelled, for fear that the bombers might strike again. But even the checkpoints were garlanded with flowers and flags, and many had music blaring. 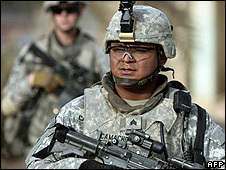 They were marking the arrival of the last day of June, the deadline for US forces to be out of Iraqi towns and cities. It’s been named Sovereignty Day, and declared a public holiday. Prime Minister Nouri Maliki has said it is a huge victory for Iraq. But the fact is that for most people in Baghdad and elsewhere, 1 July will look very similar to 30 June or 29 June. American troops have rarely been seen on the streets in many areas in recent months. 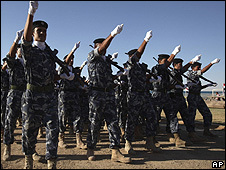 Most of the tasks involving contact with the public have been taken over by Iraqi security forces. But the withdrawal process did see the US troops either dismantling some 86 bases in the capital or handing them to Iraqi forces. At one such base, Joint Security Station Comanche on the edge of Sadr City, American soldiers were toiling last week in the baking heat to meet the deadline. Huge concrete blast-walls were taken to pieces and trucked away in the dust to another base outside the city. The US soldiers from the 1st Cavalry’s Ironhorse Brigade were packing their kitbags and backpacks, stashing them in MRAP armoured vehicles, and being driven away. “Since we came here in February, our 2,300 men haven’t suffered a single fatality,” said the position commander, Capt Chris Clyde. JSS Comanche is already a thing of the past. It is no longer a military position. It has been totally dismantled. The building used as its command centre was handed back to its original owners, the Iraqi Agriculture Ministry. On Monday, there was a symbolic ceremony at the old Iraqi Ministry of Defence building in the centre of Baghdad, the last US-held position to be handed over to the Iraqi authorities. At another big ceremony and parade on Tuesday, Mr Maliki paid tribute to the “increasing credibility” of the Iraqi security forces. 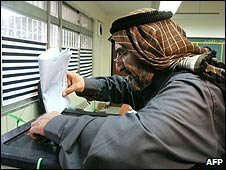 He said the US withdrawal from the cities vindicated the position taken by Iraqi negotiators in the tough talks with the US that led to the agreement under which American troops should be entirely out of Iraq by the end of 2011, and that the withdrawal timeline would be adhered to. As far as the towns and cities are concerned, while US forces remain on call outside city limits, their role in urban areas now changes to one of training and advising. “This is a huge day both for the American and Coalition forces and for the Iraqis,” said the chief spokesman for the US-led Multinational Forces, Brig Gen Steve Lanza. Much now depends on whether Iraqi forces can prevent the upsurge of violence which heralded the approach of the US withdrawals from triggering another spiral of sectarian violence – the clear aim of a series of deadly bomb attacks directed almost exclusively against Shia neighbourhoods and markets. It was just such attacks which provoked Shia militias to take brutal revenge against Sunnis in 2006 and 2007, taking the country to the brink of civil war and disintegration. 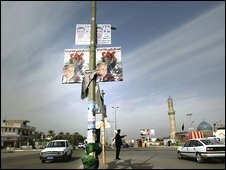 “Iraqi society, two years and more ago, looked into that abyss and rejected it, and that is the trend now,” said British ambassador in Baghdad Christopher Prentice, looking ahead to key general elections scheduled for January. The period leading up to the elections will be a real test for the Iraqi forces. They still have 131,000 US troops standing by to help if they run into trouble. But if they do have to call them back in, it will be seen as a reverse for the Iraqi government, and for President Barack Obama’s hopes of getting all of his forces out of Iraq by the end of 2011 without leaving chaos in their wake. Last January’s provincial elections set an impressive model of democracy in action, with powerful parties in some cases losing out, but accepting the results with good grace. Will they do so in future elections, when the Americans are no longer around to stiffen the resolve of security forces? Is democracy now sufficiently rooted that it will survive the US withdrawal? Haidar al-Obadi, a Shia Member of Parliament and close adviser to the prime minister, believes it is. “There is no going back to a dictatorship or a one-party system in the country now,” he said.